Address: 25 Doi Cung Street – Hue city – Vietnam. Conveniently located close to a great number of Hue’s shopping center and tourist attractions, 100m from the famous bridge of Trang Tien. 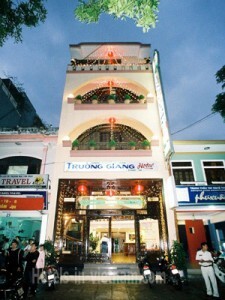 Truong Giang Hotel is known as one of the best and the newest hotels in Hue. Truong Giang is so well facilitated and offers a top quality service ensuring that stay will be comfortable and convenient. Truong Giang Hotel is know as one of the best and the newest hotel in hue. Truong Giang is so well facilitated and offers a top quality service ensuring that stay will be extremely comfortable and convenient. + No extra charge for maximum of 02 children under 08 sharing bed with parents. + Extra bed adds US$ 8/night/person. + Check-in time is 13:00 or sooner, Check-out time is 12:00. + Superior: are a smaller in 22m2 with the same facilities as standard rooms. Triple occupancy is available. + Deluxe: are a spacious in 27m2 with a huge balcony and street view. The rooms are new. + Hotel pick-up service: US$ 17/way from the airport or US$ 8,- from train station.